Are there options for how I can make my appointments? There are currently three ways that you can make appointments with Restoration Counseling Service. 1. First, you can do so using our online scheduler from the menu (top right corner, or in the window below). 2. Second, using FaceBook (you don’t need a FaceBook account for this to work). Go to: https://www.facebook.com/RestorationCS/ and look for the "BOOK NOW!" link on the left side of the page. 3.Third, you can download our mobile app for either iOS or Android devices by searching for Restoration Counseling Service. How to schedule your appointments on FaceBook! Making an appointment on our FaceBook page is currently easier for most of our clients since you are prompted to select a staff member first (and are therefore locked to that staff member) instead of selecting the appointment type first and the system suggesting other staff members for that appointment type. By the way you do not need a FaceBook account to schedule your appointment on our FaceBook page nor do you need to be logged intFaceBook if you do have an account. It works entirely within our FaceBook page, not yours. Click on the FaceBook icon (the dark blue circle) in the top-right corner of any of our web pages. This will take you to our FaceBook page. Under our large banner image, click the "Book NOW!" link to get started. Scheduling through FaceBook uses an app installed on our FaceBook page and does not require you to install anything. In fact, you don't even need to be signed in to FaceBook or have a FaceBook account for this to work! Select your staff members picture. Select the appointment type you are seeking. Navigate the calendar until you find a time that works for you and click on it. 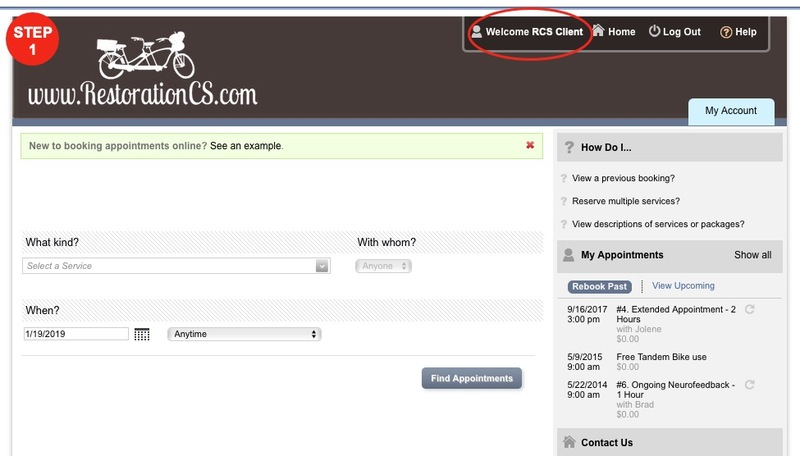 The next screen will ask for your email address and password that you used when you set up your first appointment. It is the same one you would use on our website too. If this is your first appointment, select the "Continue without logging in" option where you will be able to register for future use of our appointment system. 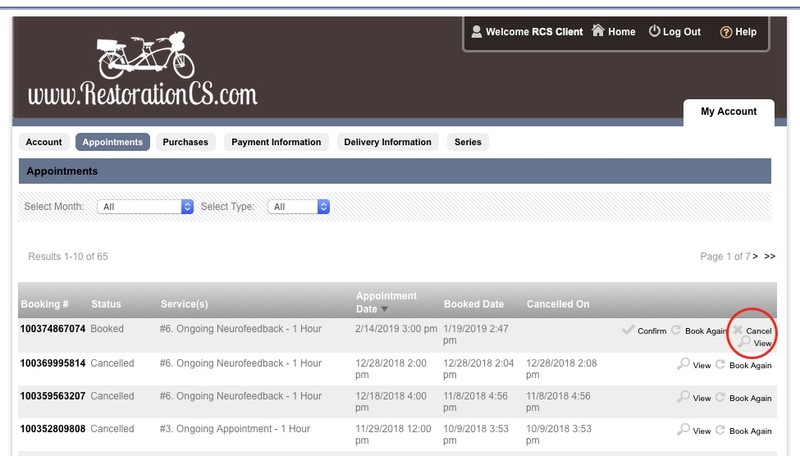 Why do we use an online appointment scheduler anyway? In a word: efficiency. Having you schedule your own appointments is quicker for you since you can see what is available very easily. It is also quicker for us since our counselors and staff are not required to help you make appointments. And we pay you back for this efficiency by keeping our rates low (since we don't have to hire a full-time receptionist to do this) and by giving you more time in session than anyone else. We believe this is a win-win and we hope you do too! It may help to know your counselor's regular schedule. Since this new system currently gives preference to the date you request an appointment (as opposed to your counselors availability), it may be helpful for you to know their regular schedule. Click on the "SignUp/Log In" link in the upper-right hand corner of the scheduling page (the window below). Make sure you are using the correct email address. Click the "Forgot your password?" link to have a password reset email sent to your email address. If you forgot your email address but know you have a profile set up, you will have to call us at 909-255-1250 to have one of us help you recover your profile. If you aren't sure what to do, you can email brad@restorationcs.com with your name, email address, and what you need and he will be happy to assist you. Where is my credit card information? You will need to enter your credit card information to secure (or hold) your appointments. Your card will not be charged until the time of your scheduled appointment. Once your credit card information has been entered, we do not have access to that information. It resides safely on a highly encrypted banking server. As such, we were unable to move any credit card information to another client account. Please understand that a valid credit card must be saved in your customer profile to guarantee your appointment. You can use another form of payment when you come in for your appointment if you'd like, just be sure to let us know when you arrive for your appointment. After you have selected your preferred appointment time, you will be required to enter your credit card information (unless it is already on file). Checking the box that says, "store this card to my customer profile" will keep you from having to enter this information each time you schedule another appointment. 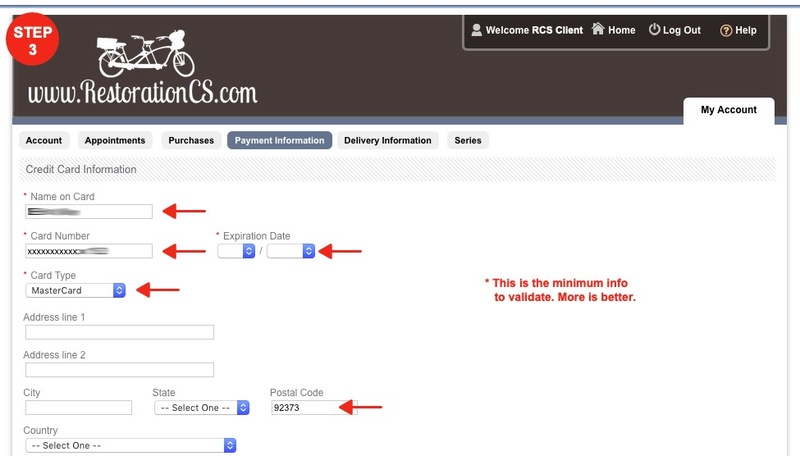 If you need to CHANGE your credit card information, look for the "edit" link when asked to verify your existing credit card with a CVC code. Once you have logged in, you will see a "Welcome (your name)" link on the top-right of the appointment window (in the brown banner). Click on it. 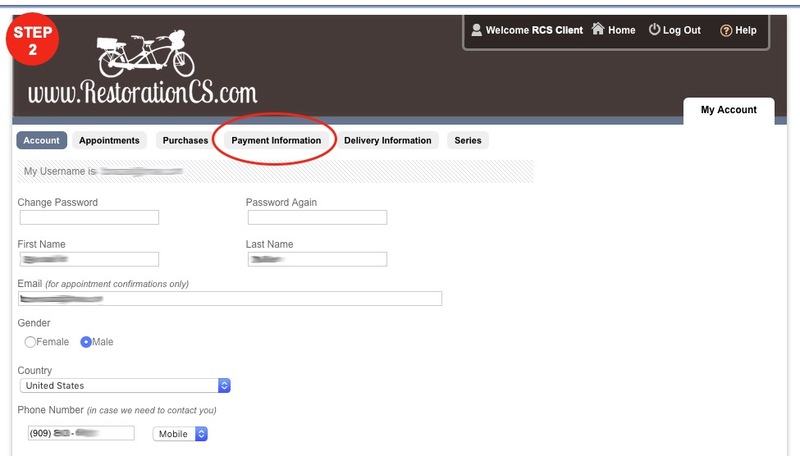 In the row to the right of "Account" you should now see the tab for a "Payment Information" screen. Click on it. There is a screenshot below to help you. While you are here, you should click on the tab labeled "Account" (just to the left of "Payment Information") and update your phone number and any other information on that screen as well. You can also change your login password from this screen if needed. Adding credit card information for the first time. Are text (SMS) message reminders available? The next time you come in for an appointment, simply ask your counselor to turn on SMS alerts for you. Your counselor will need to confirm your cell number and carrier (cell service provider). Text (SMS) messages will be sent out automatically 4 hours before every appointment. 1. Click the "Log in" link towards the top-right corner of the scheduling page and login. 2. Click the "My Account" link. 3. Click the "Appointments" tab to see your appointment history and click the "X" to the right of any future appointment to cancel it. You can use our scheduler below while scrolling back up to the directions you need above.